Go to the "Create an Account" page and enter your email address, then click on the "Sign Up" button. If you have a Facebook account, click on the "Create an Account with Facebook" button. Doing so will create an account with the email address registered under your Facebook account. If you have a Yahoo! 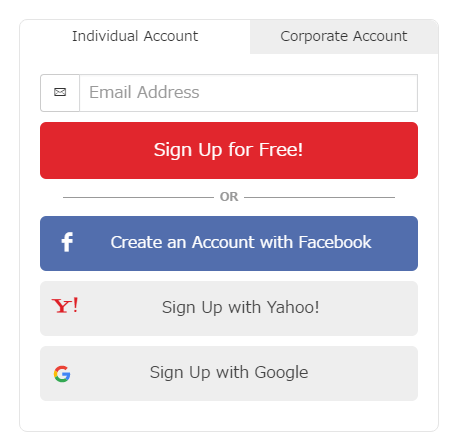 ID or Google account, click on the "Sign Up with Yahoo! ID" button or "Sign Up with Google" button to create an account with the email address registered with the respective service. When you create an account successfully, a dialog box for entering a keyword will appear. Check the inbox for your registered email address and look for the "Account Registration Confirmation" message. In this message, copy the keyword provided in the email and paste it in the "Keyword" field in the dialog box. Then click on the "Sign Up" button. * If you have created an account with Facebook, Yahoo! ID, or Google, the "Account Registration Confirmation" mail will be sent to the respective email address. You have now created a new account. Your initial Account Class for bitFlyer services is "Wallet Class." Wallet Class enables you to limited services of bitFlyer. For more useful services like purchasing and selling virtual currency at exchanges, you need to upgrade to Trade Class. How much does it cost to open an account with bitFlyer? Where do I find the keyword? 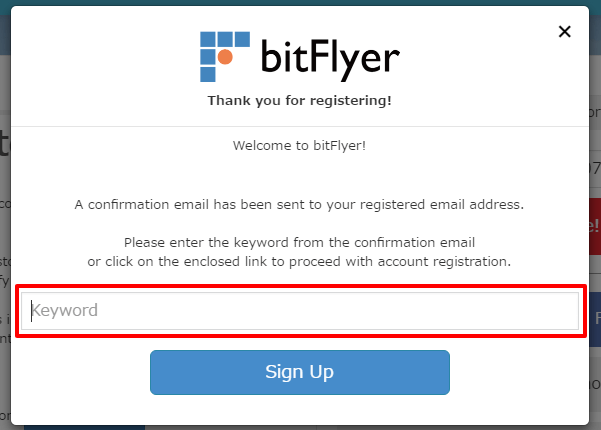 You will find the keyword in the email titled "bitFlyer - Account Registration Confirmation" sent to you at the time of registration. After entering the keyword into the account registration screen, you will be able to proceed with account creation. To upgrade to Trade Class, all of the following requirements must be satisfied. * For a list of acceptable documents and details, please refer to the link below. What kind of documents should I prepare as proof of identity? For a list of acceptable documents and details, please refer to the link below. How should I submit my personal information documents? 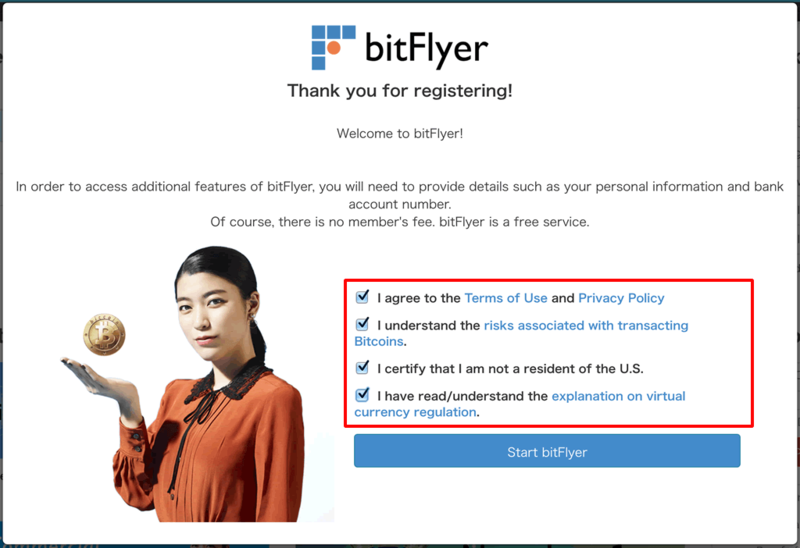 From the bitFlyer Home page, please click on the "Proof of ID" section on the right to be redirected to the submission page. For a list of acceptable documents and details, please refer to the link below. I live outside of Japan. Can I create an account? Residents outside of Japan may also create an account. I want to create a corporate account. The types of corporations that can be registered are limited to company limited (kabushiki kaisha), limited company (yugen kaisha), limited liability company (godo kaisha), partnerships in commendam and incorporated associations. Organizations such as clubs cannot be registered. What documents are needed to create a corporate account? We will ask you to submit original copy of corporate registration** and identification documents of the trade manager. In addition, corporate information, information of UBO/owner and the trade manager need to be registered. The bank account must be a corporate bank account. * Please submit original copy with clear and readable Registered Official Seal. * The name of the company, the address of the head office or principal office, the description of the business, and the officer with authority to represent the company must be included in the document. Ensure that they are the same as those entered on the registration screen. (If trade manager is not registered as the officer with authority to represent the company in the Certificate of Corporate Registration, an authorization letter is required. * Ensure that the date of issue is within 6 months of the submission. * Ensure that corporate registration number is clear and readable. * Please submit an original corporate registration document issued by government including the company name and the address of the head office or principal office. * Please also submit an official corporate document required to make by law in your jurisdiction that contain the description of the business (and the officer with authority to represent the company unless you submit an authorization letter confirming the trade manager's trading authority). * Ensure that the date of issue of these documents is within 6 months of the submission or the documents with expiry are valid. * Ensure that information written in the documents are the same as those entered on the registration screen. * Please add your handwriting statement saying "This is a true copy of the document presented to me." * If your company document is written in a language that does not use the English alphabet, please translate and attach the following statement: "I hereby certify that the above translation of an official copy of my (document type) is accurate. ... with the date and signature. *It is your responsibility to follow the rules and regulations in your country of residence and/or home jurisdiction when taking part in a transaction. I cannot receive the registration SMS message to authenticate my mobile phone. What should I do? If you do not receive the SMS message, it may be that your carrier does not accept SMS messages from international numbers. Please confirm whether this is the case. You can also try to receive your code via audio message. Our users' accounts are being upgraded according to their registration details. Services and transaction limits per day and month vary depending on your account class. Click here for more details. I am younger than 20 years old. Can I create an account? Minors require parental consent based on the user policy. In order to proceed, please send the following documents to bitFlyer. Consent Form (Please download the file from the link). Name, date of birth, address, and photograph of their face. Please note that we can not allow you to use your bitFlyer account until we receive the documents. Thank you for your patience and understanding. No, only one account may be registered per user. What are the conditions to trigger the automatic placement of the secondary orders for IFD and IFDOCO orders? In order to trigger the automatic placement of secondary orders, the first order must be completely filled. If the first order is only partially filled, the secondary orders will not be placed. While limit orders may have partial executions, market orders will only execute in their entirety and can not have partial executions. Therefore, if the first order is a limit order, the secondary order will fall into one of the following three patterns based on the “execution amount parameters” chosen when the order was placed. 1. Good ‘Til Cancelled These order amount parameters mean that the order will remain valid until it is either filled or cancelled. If the first order is only partially filled, the order will remain valid for the remaining amount until it either expires or is cancelled by the user. *Unless designated otherwise, orders will expire after 30 days. 2. Immediate or Cancel These order parameters mean that the order will be fully or partially filled at the designated price or a more profitable one. The amount that can not be filled is immediately cancelled. If the first order is only partially filled, the IFD order will be automatically cancelled and the secondary order will not be placed. These order parameters mean that if the order can not be completely filled immediately upon being placed, the whole order is automatically cancelled. In this case, the first order is immediately filled in full or cancelled in full. The first order can not be partially filled. I entered the wrong password and my account was frozen. What should I do? If you enter your password incorrectly a certain number of times, your account will be frozen for a certain period of time in order to ensure your security. Please try waiting for a little while and logging in again. If you have forgotten your password, enter your email address and press the "Request bitFlyer to change your password" button from contact page. How do I change leverage rate? If you are using the bitFlyer Lightning App, click 「Margin Account」 on the left-hand side of the screen, and select 「Leverage」 on the next page. If your questions are not resolved, please try contacting us by telephone or using the inquiry form.